Nothing is known about the exact date of its foundation, but it is certainly to be traced back to before 1000. The first documents found in which is mentioned the presence of a "priest of the Fund" back to the year 1184, and the presence of names of parishioners recurs in subsequent years. It seems that at the beginning it depended on the church of San Lorenzo in Sarnonico. The early church very little is known: it was dedicated to St. Martin. In 1519 it was built in place of another primitive, Gothic and surrounded as they used to at the time by a cemetery. In a corner of the cemetery a few meters from the bell tower was another church dedicated to St. Michael, which contains a room covered with bones and skulls of the fallen. To complete the main church and the bell tower, it took more than 50 years, and the costs were enormous. In 1579 the church had four altars dedicated respectively to St. Martin (altar), St. Martin, St. James, St. Anthony and St. Romedio. 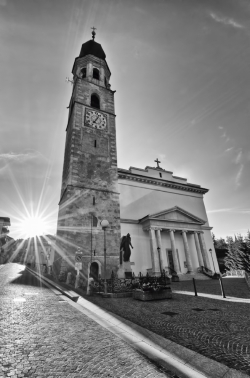 Around 1850 it was decided to enlarge the church which has become too small for the growing community: in 1853 he began the restoration work but soon it was decided unanimously to demolish the Gothic church to build a new one. On that occasion it was destroyed the church of St. Michael and moved the cemetery. 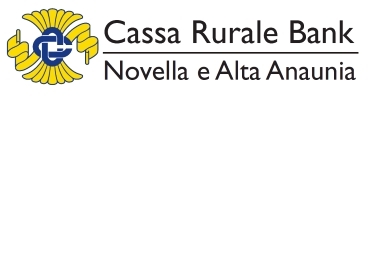 The construction work is due to local artisans, specifically the master masons Joseph Stolcis of Malone and the brothers James and Peter Mark of Salobbi. The new church of neoclassical style was opened for worship on the day of St. Martin (11 November) of 1858 and consecrated on Aug. 5, 1865 by the Bishop of Trent Riccabona Benedict, who admired the grandeur and majestic nave. It is said that the church of the Fund is the third-largest in the diocese: precedes only the Trento Cathedral and the church of Levico. Characteristic feature of the basilica is the presence of the columned portico on the front, an extension of the atrium (narthex) connecting the nave with the outside of the Church. In the recent history of the basilica, it is worth noting the great work of restoration began in 2007, which allowed to return the church to its original splendor thanks to a work of radical cleaning. During the work, which should have been concluded in 2009, the discovery of unknown decorations on the vault and in the adjacent chapels has been shifted forward by one year the conclusion of the restoration, to allow the unveiling of the time and the side chapels. The church tower was built in several stages. It was started in 1447, the date carved in Gothic letters on the bow of the small front door, was elevated to the second ledge in 1471. Initial work from three meters. The work was realized by the "Masters of Como" of Valle d'Intelvi (between lakes Como and Lugano). In 1528 we talk about a legacy to the municipality for the elevation of the bell tower up to the current balcony; in 1774 he built the last section of octagonal shape, covered by a dome pear and golden ball surmounted by a cross. In 1780 he was cast here at eight bells from the firm Ernesto Ruffini of Reggio Emilia. The concert belfry of the Fund is considered the most majestic and tune the Valley. Of the eight bells, 5 were requisitioned by the Austrian military in 1917 and melted down to make cannons for the first world war. Were recast after the war, in the early 20s, the company Colbacchini of Trento. In front of the bell tower the war memorial by the sculptor Fozzer. The church of San Rocco was built by the City of the Fund in order to fulfill a vow made during the great plague that threatened the inhabitants of the country around 1630. The church was consecrated on August 2, 1649 while he was the Prince Bishop Carlo Emanuele Madruzzo. The altar probably comes from another church as it dates back to 1590. It represents the Virgin and Child with a distinct Latin and translation reads: "Bring roses to Mary with heart modest, and it will change back from heaven with heavenly rewards." A disastrous fire, produced by lightning, destroyed in 1847 the roof of the church along with some neighboring houses. It was quickly restored and raised about two meters. Within a Via Crucis eighteenth century well made, two old stone holy water fonts and a painting depicting the Madonna with two saints. A fund going up north, just outside the village you can see a curious hill, isolated on the vast plateau that rises to the west, covered by a thick blanket of pine trees. The church dedicated to Saint Lucia Circo and is easily accessible from the center of the Fund with a walk. Tradition has it that this church was formed on the height with the ruins of the castle called "Castrum Sanctae" which was built in 1271 by Count Meinhard II of Tyrol. The present building, dating from the fourteenth century, it was modified and extended in 1673. The whole structure has a simple design: a narrow facade with portal, windows railings, a rose, and a small bell tower that is due to later interventions to increase. A cycle of frescoes by the famous Master of Sommacampagna and dating from the second half of the '300, adorn the outer walls. On the east side are a Crucifixion and St. Christopher, both recently restored late Gothic period. The real jewel is contained within: the nave is painted by a cycle of eight episodes commented captions Gothic and Latin dedicated to the Stories of Saint Lucia dated around 1380 and probably due to the Master of the Madonna of Castelbarco. The theme comes from Legend certainly Aulica dell'agiografo Jacopo da Voragine, which tells the story of the saint of Syracuse and episodes of martyrdom. The pledge of grace at the tomb of St. Agatha in Catania's mother Lucia, Euticia, the vision, the vow of chastity, the complaint of the boyfriend to Pascasio, tyrant of the city, scene of martyrdom, dragged by oxen, to the stake, the wounding sword etc., up to the communion of the holy and the burial, the death of the tyrant finally Pascasio. Also very precious wooden altar of the seventeenth century that presents a dais depicting the Baptism of Jesus, the meeting of the Baptist with two Apostles, the Meeting of John the Baptist with Jesus, the Beheading of John the Baptist and two episodes depicting Salome who collects Baptist's head and hands it to King Herod. The coloristic tones in bright red and green recall ways of painting Po Venetian, transported by the culture Verona Padua, emulates the experience of Giotto and Altichiero, in an alpine environment difficult to achieve, but very open to new aesthetic Italian. The perimeter of the oldest church is detectable by the eight frescoes, dedicated to the life of the saint, which are the most interesting part of the building. The subjects of these paintings are: The dream of St. Lucia, the visit of St. Agatha in Catania, St. Lucia by the tyrant Pascasio that the prosecution, punishment of Saint Lucia, Communion and tomb of Saint Lucia, the punishment of the tyrant Pascasio. On the lower frame of the first picture Inama read the date of 1356 is not excluded that in the history of St. Lucia there are other paintings or ornaments. Regarding the dating of these works and about the author, critics and scholars are not quite agree. There are two opposing arguments: the first that the author is an artist of the school of Bressanone known as "master of the Scorpion" (Gaspar Blattmirer) who also worked in Castelfondo. Cioò was deducted from the alleged signature of the painter, just a scorpion on a banner held up by a rider in the last part of the history of St. Lucia. The other argument, given the frescoes around 1376 and attributed them to the author of the fresco of Castelbarco of Bolzano. 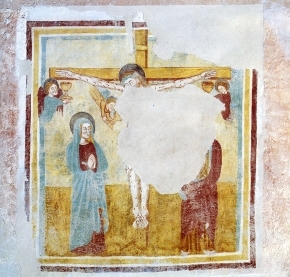 The church was decorated in the fifteenth century on the southern side by two other frescoes, now very deteriorated, representatives S.Cristofoto and the Crucifixion. As reported by the date on the one hand, 1673 marked the great renovation of the Church. It was lengthened and was built the great apse according the style of the time. In 1894 there were other big jobs: the nave was raised to bring it to the height of the apse, was created a new façade with belfry, new front door, with stained glass rose window. The vault was built ribbed supported by corbels with emblems and symbols. In 1899 it was walled on the south facade, outside, a plaque in memory of Joseph Cristanelli that in 1896 it was made. Among the images of Saint Christopher very recurrent in the Trentino region, this, the Church of Saint Lucia, is considered an L and the oldest dates back to the mid-fourteenth century. Other depictions of the saint have been attributed to the same hand and in particular, in the Val di Non in Sardonico on the outside wall of the church San Lorenzo and the bell tower Revò. By chance it is a rambling artist active between Verona area and the Trentino Alto Adige that left many frescoes. 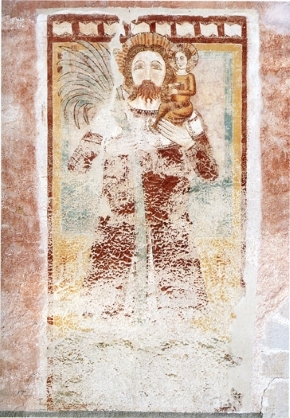 St. Christopher is represented here according to the description that appears in the Golden Legend by Jacobus de Voragine, which giant leaning against a high stick strongman leading shoulder in Jesus. Legend has it that this giant was on the bank of a river and helped the travelers to cross. One day he helped a child, but arrived in the river, the water became dangerous and the child began to weigh like lead. Then he discovered that the child was actually Jesus Christ who told him to plant his stick near the hut that the next day would find him strongman and laden with fruit and it was. Usually the Saint was depicted outside churches or bell towers in large size so that it could be seen even from a distance. According to popular belief those who see his image throughout the day was not taken ill. The current neo-classical church of St. Michael, in the municipal cemetery of the Fund, named after a previous located near the parish of St. Martin, the main town. Around the church of St. Martin it stood the cemetery and the church of St. Michael was destined to exposure of the bodies of the faithful that for some unfortunate event, were killed outside their home. Under it there was an ossuary said, in dialect, "chianal of bones." When in 1853 he began the demolition of the old gothic church of St. Martin, to build the current neoclassical building, St. Michael also was demolished. The cemetery was moved to the north of the country, where it is now. Under the parish priest Francesco Sicher Coredo, who held the dean between 1866 and 1895, work was begun. small church located at the intersection of street and road B.Clesio Doss Sedrena. church located in the village of Sant'Anna Tret built in the seventeenth century, then enlarged in 1847.